There will be commemorative drinkware available for purchase at reunion dinner. Correction for girls Friday night, July 5......location. Stix is closed permanently. This information was not available before invitations and Facebook notifications were sent. Tim and Pat Rohrmoser have welcomed us to use their home. We will be outside, chatting and catching up. Feel free to bring a lawn chair. They have a huge, beautiful Victorian home located at 401 E.Foster, corner of Foster and Delia. He has hit a rough patch, having suffered a major stroke in late August. Unable to read his mind, the reunion team is trying to press on. PLEASE share and watch here for updates. Please text Jessica Steinberg (mox) with questions 989-289-2099. Thanks all. 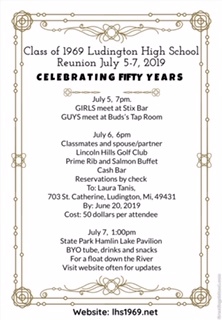 The 1969 graduating class of Ludington High School will hold it's 50th reunion at the Lincoln Hills County Club on Saturday, July 6, 2019 beginning around 6pm. Other events willl include a float in the 4th of July parade, guys night out at Bud's Tap Room,amd girls night out at Stix Bar Friday the 5th at 7pm and a picnic at the Hamlin Lake beach pavilion at the Ludington State Park at noon on Sunday the 7th. Featuring tubing down the Sauble from the dam to the bridge. Much of what is planned is still in the early stages of development so keeping checking this site periodically for updates. We would like to post pics of your high school car (wheels). If you have one send it to Tim Rohrmoser at his address or by email or text as an attachment. See his profile for info.